It’s a new year, which means you probably have new goals. Eat better. Exercise more. Spend less. Here’s another one to add to your list: Get a tremendous deal on Showtime®! 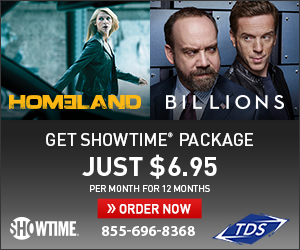 For a limited time, you can add Showtime’s array of blockbuster movies, critically acclaimed original series and award-winning sports coverage to your TDS® channel lineup for just $6.95 a month for 12 months. TDS customers receive 22 different Showtime and The Movie Channel channels when they subscribe to Showtime. And with the Showtime Anytime app – free with your Showtime subscription – you can access your favorite shows, past and present, anywhere and anytime. Binge-watch Showtime classics like Dexter and Weeds or get up to speed on current series such as Ray Donovan. Again, this offer ends March 3 so call us at 855-696-8368 or visit our website to add Showtime to your channel lineup today! $6.95/mo. Showtime offer ends 3/3/17. Offer valid for new Showtime subscriptions only. Promotional price valid for 12 months. After promotional period, current rates apply. HD channels requires an HD Capable Set Top Box. Local and state sales tax and other fees, charges, and restrictions may apply. SHOWTIME and related marks are trademarks of Showtime Networks Inc., a CBS company. Delinquent accounts may lose service. Certain services not available in all areas. Price may vary by serving area and is subject to change without notice. TDS® is a registered trademark of Telephone and Data Systems, Inc. Copyright © 2017, TDS Telecommunications Corporation, All Rights Reserved.